PRYME Radio Products offers a full line of remote speaker microphones, mini-boom mics, throat mics, earphones, surveillance kits, and other audio accessories for most major brands of portable two-way radios. PRYME products have applications in security, retail, business, industrial, and public safety environments. More than just offering microphones, PRYME offers complete solutions for your audio product needs. PRYME Radio Products has been serving the commercial, industrial, and amateur two-way radio industry since 1995. Quality and Service coupled with Selection and Low Cost, PRYME Radio Products is the perfect solution for all of your audio accessory needs. 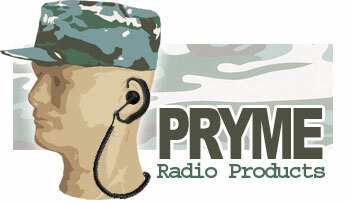 PRYME Radio Products prides itself on innovation, reliability, affordablility, and practicality. When it comes to audio accessories for two-way radios, PRYME is your one stop solution.